Yosh! What a crazy, almost-brilliant weekend that was. Friday: Joe, Amber and Teralynn came over to my place for some pizza, films and serious snuggling. Just take a look at the snuggling! 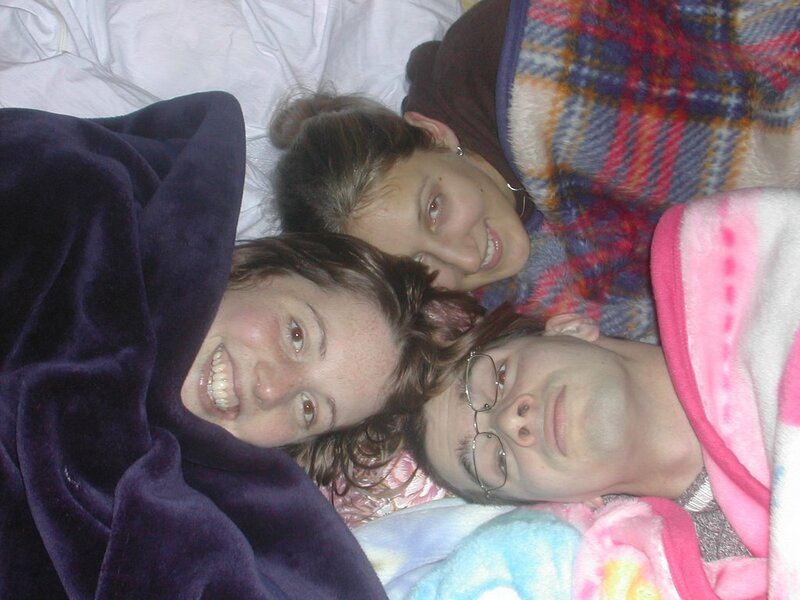 Piles and piles of futons and blankets… aaaah! Hard to believe, but Amber and Teralynn had never seen The Goonies before, so we gave them something of an education, as well as watching a crazy-fun looking snowboard race on the Olympics, and apparently annoying my neighbour with lots of noise. Oh dear. Saturday: Up at the very respectable hour of 10am, and then off to Ikeda for the annual sake festival. For the humble sum of Y1000, you get to go around all the breweries in Ikeda, and sample all the sake they have on offer. For the sake-lover, it’s a treat. For someone like me who likes the stuff, but not enough to drink it regularly, it’s a good chance to go and get very sociable with the locals, who are all drunk, and think you are wonderful. I came away with a small bottle of what they called ‘champagne sake’, which is a young sake, slightly sparkly, and nice and sweet. Something happened to my bottle over the rest of the weekend, though, and I think that most of the fizz may have gone out of it. Hmm. 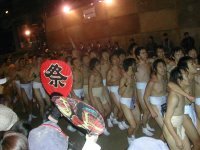 After the sake festival, a bunch of us jumped on a train to go to Okayama’s annual Naked Man festival. It’s an ancient festival, to do with machoism, masochism (takes place in mid-February, in the middle of the night, and involves cold water, and pain) and virility. For the girls and wimpier guys, it’s an excuse to appreciate the true value of clothes, and their cold-repelling properties. Actually, we just stand around watching the guys run around nearly-naked, getting progressively colder, until midnight, when there’s a brief tussle for a couple of sacred sticks thrown into the crowd by the temple priests, and then it’s all over. It’s a pretty violent affair: two thousand men scrabbling over two little sticks of wood, and not surprisingly, there are some quite serious injuries that occur every year. Thankfully, our boys returned to us more or less in tact, if somewhat dazed and amazed at what they had just put themselves through. Nate flopped down beside me on the bus after the festival, looking drunk and tired, and declared it had been the most harrowing experience he’d ever been through, and that his life had flashed before his eyes. He’s going to get quoted in Ehime’s ‘Mikan’ newspaper for that! After the nakedness, we trooped back to Okayama proper for the after-party thrown by Okayama AJET. And I ran smack into Stu. Someone had told him I was in town, and we met up at the party. It was… interesting. I had actually been hoping to see him, but it made me a bit sad, really. We didn’t get to talk properly, the place was mobbed and noisy. But he looks great, and still makes me laugh. Man. 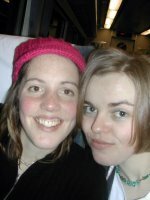 Trying not to dwell, but it actually put a dampener on the whole weekend… Not cause it was BAD to see him, you understand. Just cause. Sunday was spent in a couple of cafes, eating great bagels, drinking buckets of coffee, and just shooting the crap for a while. Back in Miyoshi by 3pm. There was a house fire here yesterday, and a man died, so that was a pretty sobering end to the weekend. Mind is pretty busy now, digesting and thinking about a lot of things. Also reading a book called ‘Naked Economics’. It’s a very interesting read, and really puts the world into perspective. Currently listening to a bunch of new music procured from the likes of Amber and Nate. Highlights include Neutral Milk Hotel, Loop and ‘Fevers and Mirrors’ by Bright Eyes. OMG I can't believe you saw Stu - was it like a punch in the stomach? I'm jealous of you guys all havin so much fun! Did you say you have a bootleg copy of InDesign? Do you have Japanese fonts installed on your computer? Hit command-T to bring up the character palette. Then select one of the Japanese fonts, and try typing. I'll bet you the Japanese works! No no no no no, InDesign, Adobe InDesign, the layout program. I was sure you had said that back in the days of TeamTaughtPizza you had aquired a copy of InDesign, but couldn't get the kanji or kana to work in it. I called Adobe Japan a few days ago, and they told me how. AHHHHH! I see! No, I never did get a copy of InDesign for TTP, part of the reason was cost, and yes, the other part, was that, from the website, I couldn't figure out whether or not Japanese would work on the English version. But now I know. 18 months too late! :) I'll be sure to pass on that info to the new crew though! Cheers!